My collection of actor paintings is a little embarrassing. And yet, the collection grows, and so does the weirdness. 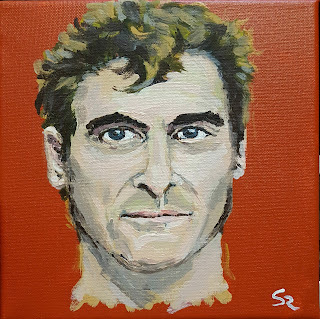 Joaquin is one of my favorite actors, and I was wishing he would make more movies. Then I looked him up for this painting and found he's making lots of movies... I just haven't seen them. I guess if a movie isn't a big budget blockbuster, it's not on my radar. Sad! Follow Susan's board paintings on Pinterest. The copyright of all the images in this blog remain with Susan Racz. Picture Window theme. Powered by Blogger.